New software developed by AE Smith Building Technologies is now making it even easier to stay on top of your NABERS rating by providing a simple up to date count of a building’s NABERS star rating in real- time. Loaded as a Windows gadget, the Real-Time NABERS App by AE Smith quietly runs in the background of a Windows PC. 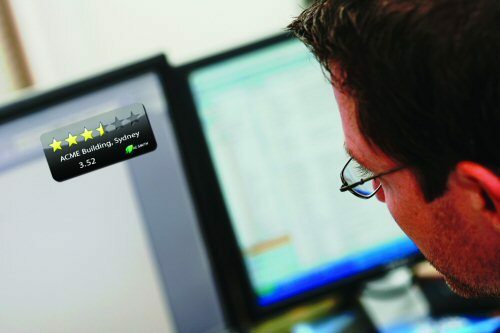 With just a quick glance, proactive building managers can now see their calculated NABERS rating – right at that very moment. Depending on what’s important to that facility, other key data can also be presented such as how far away they are from a higher NABERS rating level, or how much more energy needs to be saved to improve their rating. AE Smith Building Technology’s Brad Disher says the Windows based software is not only user friendly but ensures managers can stay on top of issues before it has a negative impact on their annual NABERS review. “NABERS ratings are retrospective, and are conducted annually, so once you have a star rating, you’re stuck with it for 12 months,” explains Brad. The simplicity of the software means property managers can quickly and easily monitor how a NABERS rating might be affected day-to day, week-to-week and month-to-month. “This technology also means you don’t need codes, passwords or the ability to analyse complex data or CO2 outputs. It just simply tells you where you’re at and when you need to worry about it with a quick glance at your PC desktop,” adds Brad. This unique technology is enabling facility and portfolio managers to be more proactive in managing their NABERS ratings – a critical benchmark for capital value, leasing procurement and rental abatement. “The new software is developed as a cloud based solution, meaning that the information can be deployed to any “connected” medium. Smartphones, tablets, dashboards, we can send the information to where it is needed, discreetly, and in a user friendly manner. “The last thing you want to be doing is only worrying about your NABERS rating every 12 months when it’s officially reviewed. “Significantly, this technology puts you in charge in real-time, rather than retrospectively once a year,” emphasised Brad. For more information about the Real-Time NABERS App, smartphone integration and dash boarding of key building metrics please contact Brad Disher.